PT Kereta Api Indonesia (Persero) - KAI or referred to as "KAI Group" is a the largest state-owned railways operator in Indonesia, fully-owned by the Government of Indonesia. KAI Group operates primarily as a railways operator in Java-Bali and Sumatera regions. Headquartered in Bandung West Java, KAI Group runs its business through 9 Operation Area Offices (DAOP), 3 Regional Division Offices (DIVRE), 3 Sub Regional Division Offices (SUB-DIVRE), 5 Balai Yasa spread across Indonesia (as of December 2015). 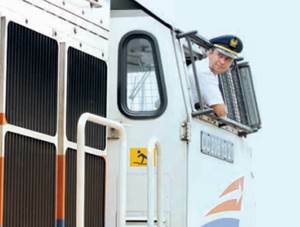 The state-owned railways operator also supported by a total of more than 25,361 staff. KAI Group now has 6 key subsidiaries; namely PT Kereta Api Logistik (99.90% owned by KAI Group), PT Kereta Api Properti Manajemen (99.90%), PT Kereta Api Pariwisata (99.90%), PT KAI Commuter Jabodetabek (99.78%), PT Reska Multi Usaha (95.01%), and PT Railink (60%). In term of financial positions, KAI Group showed a strong performance in 2015 and recorded a growth of 33.02% in total revenue amounted to Rp 13,938.90 billion over the previous year. The Company's total revenue in 2014 amounted to Rp 10,478.07 billion, according to PT Kereta Api Indonesia (Persero) Annual Report 2015 as quoted by JobsCDC.com. KAI group booked total net profit of Rp 1,398.24 billion in 2015 or 62.27% increase as compared with Rp 860.87 billion in 2014. Male/Female, not older than 26 years of age. Minimum height of 165cm (Male) and 160cm (Female) with proportional weight. Healthy physical and spiritual (attached a medical and free of drugs and colorblind certificate from a doctor). Education background D3/S1 any field with minimum GPA of 2.96 and minimum accreditation B. Attached SKCK from the police, health certificate, diploma / transcripts, course certificate(s). Minimum height of 155cm with proportional weight. Ruang Customer Service Stasiun Yogyakarta (Tugu) - Jl Margo Utomo No 1, Kec Gedongtengen, Kel Sosromenduran, Yogyakarta, DI Yogyakarta, 55271. Ruang Customer Service Stasiun Lempuyangan - Jl Stasiun Lempuyangan, Kec Danurejan, Ke. Bausasran, Yogyakarta, DI Yogyakarta, 55224. Ruang Customer Service Stasiun Solo Balapan - Jl Wolter Minginsidi No 112, Kel Kestalan, Kec Banjarsari, Surakarta, Jawa Tengah. JobsCDC.com now available on android device. Download now on Google Play here. Please be aware of recruitment fraud. The entire stage of this selection process is free of charge. PT Kereta Api Indonesia (Persero) - D3, S1 CS on Station, Accouncer KAI February 2017 will never ask for fees or upfront payments for any purposes during the recruitment process such as transportation and accommodation.